Here is the lyrics of Vaarwel aan die Vierkleur, as they appear in the FAK-Sangbundel Fourth Edition 1979, sixth printing of 2002 published by Protea Boekhuis for the Federasie van Afrikaanse Vierkleur I kept, Four Colours pronounced Vierkleur, translation, the word Vlag is the Flag. In October 1874 the Volksraad adopted a new flag based on the "Voortrekker flag" for the ZAR, with the the red saltire being fimbriated in white. However, the Volksraad later reversed its decision in May 1875 when President Burgers, who was not satisfied with the vierkleur flag, was away overseas! The new saltire flag was retained as the Presidential flag, but soon fell into abeyance as some felt it was too similar to the Union Jack. The Vierkleur gave way to the Union Jack during the British annexation of the Transvaal between 12 April 1877 and 03 August 1881, following which the independence of the Transvaal was again formally recognised and the Vierkleur restored. The ZAR came to an end following the Peace of Vereeniging on 31 May 1902 which signaled the end of the Anglo-Boer War and the ZAR once again came under British control as the Transvaal Colony. The flag of the ZAR was incorporated into the new South African flag in 1928 while its arms were retained as the provincial arms of the Transvaal in 1951. This flag was registered with the South African Bureau of Heraldry as the flag of the South African Republic for the Office of the Prime Minister together with the flag of the Republic of Orange Free State on 30 April 1983 (application 08 January 1982, amendment 05 March 1982). Certificates were issued for both in Afrikaans on 14 October 1983. Source: "Some South African flags, 1940-1990" compiled by F.G. Brownell, South African State Herald. The Vierkleur of the Zuid-Afrikaansche Republiek was designed by Reverend Dirk van der Hoff and was hoisted for the first time in Potchefstroom on 06 January 1857. It was officially accepted by the Volksraad (House of Assembly) as the flag of the ZAR on 18 February 1858. Following the occupation by the British, the flag was removed but was raised again on the Day of the Vow (Geloftedag) (16 December) in 1880 in Heidelberg. spoken Afrikaans, but I would guess that it is a form of the French "blanc", white). Translation off the cuff - any improvements welcome. and the current Free State Province the old Oranje Vrij Staat. Sneuwel means literally to die in warfare; oorwin means to win in battle. In December 1880 rebellious Boers again declared a South African Republic, which re-established the Vierkleur. This is the war flag of the former South African Republic Transvaal, used during the Anglo-Boer War 1899-1902. Transvaal flag or Vierkleur is used by the Afrikaner Volksfront Afrikaner People's Movement, AVF as their Vryheidsflag Freedom's flag, with an orange stripe replacing the red one. The vierkleur 4 colour design was first used by the Boer Republic of Land Goshen Republiek van Land Goshen) between 1881-84 where the vertical stripe was green and the horizontal stripes were black, white and red. This was followed by the New Republic Nieuwe Republiek between 1884-88 whose flag had a blue vertical stripe and red, white and green horizontal stripes. The Zuid-Afrikaanse Republiek ZAR/Transvaal flew the now traditional vierkleur of a green vertical stripe and red, white and blue horizontal stripes between 1858-1902. On specifics, Carr says the green stripe in the Transvaal vierkleur is supposed to represent Young Holland whether there was an actual movement by this name in 19th century South African and/or the Netherlands, or whether it was simply a reference to the nationalist ideal of groups like Young Italy, I don't know. I received a message from an Afrikaner who states that the green band on the flag represents how fruitful the Transvaal is. It was designed that way by a certain Dominee Reverend Dirk van der Hoff. The flag was hoisted for the first time at Potchefstroom. The Vierkleur of the Zuid-Afrikaansche Republiek was designed by Reverend Dirk van der Hoff and was hoisted for the first time in Potchefstroom on 06 January 1857. It was officially accepted by the Volksraad (House of Assembly) as the flag of the ZAR on 18 February 1858. Following the occupation by the British, the flag was removed but was raised again on the Day of the Vow Geloftedag 16 December in 1880 in Heidelberg. The Transvalers fought under this flag between 1899 and 1902 during the Anglo-Boer War. Following the Union of South Africa , that is the joining of the former colonies of Natal,Cape, Transvaal and Orange River on 31 May 1910, South Africa used defaced red and blue ensigns.Having suffered defeat in the Anglo-Boer War 1899-1902,many South Africans particularly of Boer extraction found these flags unacceptable. Discussions about a new flag had taken place from time to time but were interrupted by such pressing issues as World War I and achieving Dominion Status within the British Empire etc. and it was only in 1925 that the matter began to receive renewed attention. The Balfour Declaration adopted at the Imperial Conference of 1926 defined in general terms the mutual constitutional relationship of the self-governing members of the British Empire later Commonwealth whereby Great Britain and the dominions were "equal in status, in no way subordinate to one another" and as such South Africa, as an independent state was entitled to a flag of its own. The flag issue in South Africa was also considered along with the question of nationality. The issue of inclusion of the Union Jack proved to be a very emotional subject, with the English-speakers on the one side demanding its inclusion and the Afrikaners Boers seeing its a symbol of British imperialism demanding it be excluded! A number of proposals were put forward but it was not until the Prinzenvlag design based on the House of Orange that consensus began to emerge. This design was based on the commonly held view that Jan van Riebeeck has raised an orange, white and blue horizontal tricolour when he arrived at the Cape in April 1652.The original design had a quartered shield in the centre, each quarter having a symbol to represent the territories making up the Union.Various other designs were submitted to a Parliamentary Committee which had been established to resolve the issue but none found favour. The compromise design eventually adopted saw the flag of the Republic of the Orange Free State hanging vertically in the centre of the white stripe of the Prinzenvlag with the Union Jack spread horizontally towards the hoist from the centre and the flag of the Zuid-Afrikaansche Republiek Transvaal spread towards the fly.In terms of the Union Nationality and Flags Act of 1927 South Africa had two flags, namely the Union Jack to denote association the British Commonwealth of Nations and a national flag described as being. Three horizontal stripes of equal width from top to bottom, orange, white, blue; in the centre of the white stripe the old Orange Free State Flag hanging vertically, spread in full, with the Union Jack adjoining horizontally, spread in full, towards the pole, and the old Transvaal Vierkleur adjoining horizontally spread in full away from the pole, equidistant from the margins of the white stripe. The flags shall be of the same size and their shape shall be proportionally the same as the National Flag and the width of each equal to one-third of the width of the white stripe.This Act came into force on 31 May 1928 when both the new national flag and the Union Jack were hoisted together for the first time at simultaneous ceremonies at the Houses of Parliament in Cape Town and at the Union Buildings in Pretoria.The flags first hoisted at Parliament are now on display in the Old Assembly chamber. Republic in the Transvaal, formed between 1857 and 1864. Horizontally red-white-blue with a vertical green stripe at the hoist (known as the "Vierkleur" or four colour) 1857-1902, except for 1874-75 when the Voortrekker flag, but with the saltire fimbriated white, was restored . When the ZAR as officially recognised by Britain in January 1852, it had neither arms or a flag of its own. The flag which had been flown by the Voortrekkers was the so-called "Voortreeker Flag" which was a red saltire on a blue field. "It is resolved that a flag for the South African Republic shall be adopted, consisting of the following colours: Red, White and Blue, horizontal, each of equal width and placed one above another, and Green perpendicular next to the staff". This resolution contains the only formal description of the vierkleur which was to be the national flag of the ZAR, apart from two short interruptions, until the end of the republic until 1902.
is a poetic form harking back to Dutch for the more usual Afrikaans aand. The Combined Republican Flag of the Anglo Boer War has an orange stripe added under the entire "vierkleur" (the so called "vyfkleur" - 5 colours). In Burger's 'Sovereign Flags of Southern Africa', (1997) are two 'vyfkleuren' (five-colours). The combined Boer armies sometimes used flags combining their colors. This flag was probably displayed by the Transvaal forces: the 'Vierkleur' (four colour) with an orange bar across the bottom. Used around 1899-1901. The other one was horizontally Red - White - Orange - Green with a Blue canton with a white anchor; below the anchor the capitals . Another example of a "unity" flag was an Orange Free State flag with a green diagonal stripe across it (from bottom left to top right). Burgers mentions this as being from a shoulder patch worn by Mrs JJ van der Merwe at a Concentration Camp in the town of Bethulie. It is unknown whether this design was ever made into an actual flag. Here are further examples of the so-called "Unity" flags of the Anglo-Boer War (1899-1902). These were unofficial flags representing "Boer" forces fighting the British during the Anglo-Boer War. Because the soldiers of the two Boer republics fought side by side, they used a number of flags combining the colours of BOTH of the Boer republics and these have since become known as the "Unity" flags. 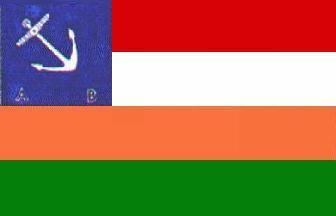 The most famous is probably the so called "Taungs Flag" which was a Transvaal "vierkleur" with an extra orange horizontal stripe along the bottom. 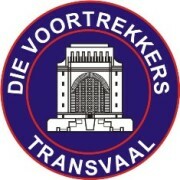 As shown on the pictures posted by Carsten and later described and giffed by Martin Grieve, the most popular designs were variations of the old Zuid-Afrikaanse Republiek (Transvaal) vierkleur. André Burgers (in his South African Flag Book manuscript) also mentions a flag made by a Boer Prisoner of War, H.J Steyn, in Diyatalawa camp, Ceylon (now Sri Lanka). This had an orange diagonal stripe on a vierkleur, but going from the top left to the bottom right in contrast to the Hindon and Maritz flags where the diagonal orange went from bottom left to the top right hand corners. A rectangular flag proportions three by two, consisting of seven horizontal stripes of equal width alternately white and orange and a canton of three stripes, red, white and blue in the proportions four by three. Source: "Some South African Flags, 1940-1990"
The Batte of Majuba was virtually the last battle between British troops and fighters from the South African Republic (aka the Transvaal) in what is called the First Anglo-Boer War (1880-81). The other Boer republic, the Orange Free State, did not participate in this war. Don't confuse it with the Second Anglo-Boer War of 1899-1902, fought between Great Britain on the one side and the South African Republic and Orange Free State coalition on the other. Even though the Orange Free State is not directly linked to the Battle of Majuba, it is quite usual that at any Boer commemoration the distinctive flags of both former republics as well as flags shared by both in history are flown. It is therefore possible that the flag with the diagonal stripe is a variant of a common war flag. I have an idea I've seen the "Vierkleur" with the additional orange stripe as a variant (probably Boer War period), and I have an idea the one with the diagonal stripe has a similar provenance, but I'm not all that familiar with either. The one on the left is entirely unknown to me, but the unidentifiable "wapen" in the middle is of a type with the kind of badge (wapen) that the Boere are fond of devising, with all sorts of irrelevant details and lettering and not sufficient cohesion to allow identification from any distance. I notice a patch of orange in the hoist that looks as if it forms part of a rhomboid - a very strange blend. I am privileged to be in possession of a manuscript of AP Burgers' book on South African flags - not yet published, but one day hopefully. One of the flags depicted is a "vierkleur" with orange band from lower hoist to upper fly and this is the "Maritz flag". Maritz is a very popular Afrikaner surname, and many Boer families had their own flags during this period. Another flag, from the same source shows a "vierkleur" (4 colour) flag with the orange diagonal starting out at the right hand side of the green vertical band, and this is the flag of Oliver John "Jack" Hindon, (1874-1919) who was a Scot and Boer General fighting against the British. Hindon's girlfriend made the flag and gave it to him before the battle commenced. When the Republic of Orange Free State came into being on 23 February 1854 it possessed neither arms nor a flag. On 15 May 1854 the Orange Free State Government Secretary wrote to the Republic's Consul in the Netherlands and asked whether King William III would be willing to grant the OFS arms and a flag. This was followed by a personal letter to the King from President Hoffman on 15 October 1854. In February 1855, Hoffman's presidency came to an end and there followed an inter-regnum of 6 months when JN Boshoff was President. He knew nothing of the approach to the Dutch monarch. The request for arms and a flag was eventually granted and on 12 January 1856 the King's special envoy, Cornelis Hattingh, arrived in Bloemfontein with the royal gifts. The flag consisted of seven equal alternating horizontal stripes of white and orange with the Dutch flag in the canton. Both the arms and flag remained in use until the OFS came to an end following the signing of the Treaty of Vereeniging marking the end of the Anglo-Boer War on 31 May 1902. The Republic of the Orange Free State then became the British controlled Orange River Colony until it was incorporated into the Union of South Africa on 31 May 1910. The flag of the Orange Free State (OFS) was designed in 1856 by King William III of the Netherlands, on request of the OFS Volksraad (parliament). It is said to represent the bonds between the OFS and the Netherlands, and it's royal house (of Orange). Carr goes on to say that some claim the three orange stripes were a reference to William the Third of Orange being the designer. This flag was registered with the South African Bureau of Heraldry as the flag of the Republic of Orange Free State for the Office of the Prime Minister, together with the flag of the South African Republic, on 30 April 1983 (application 08 January 1982, amendment 05 March 1982). Certificates were issued for both in Afrikaans on 14 October 1983.